Can I Reuse My Old PC’s Power Supply In A New Computer? One of the best ways to reduce the cost of upgrading your PC is to simply re-use the components which don’t need to be upgraded. Yeah, you’ll have to replace the graphics card or processor. But other parts can be salvaged. An old power supply is often on the list of potentially reusable components. Many geeks worry, however, about the reliability of the old unit. Will it have the power required? Can it be trusted to last? Here’s how to find out. A power supply is often a mystery. It’s not hard to download a tool like PC Wizard Get Detailed Info About Your OS & Hardware with PC Wizard Get Detailed Info About Your OS & Hardware with PC Wizard Read More and learn all about your motherboard, RAM, graphics card, and more. The power supply, on the other hand, is mysterious. Software won’t tell you much about it. That’s why they’re labeled! Turn off your computer, unplug it from the power and take a look at the supply. It should have a label that looks like this. These labels don’t all work in the same way but there should be a section that describes maximum load or output. That is the total amount of power that the supply can handle overall. You can use that figure and compare it to what’s recommended for the new hardware you’d like to purchase. Also of interest is the section that describes output for each specific type of voltage. That’s the list +5V, +3.3V, +12V and etc. Each of those values will be shown alongside an amp rating. Pay close attention to the 12V value (aka rail). The video card, which is often among the most power-hungry components in a system, draws power from it. I recommend about 30A on the 12V rail if you would like to run a moderately powerful video card. If the maximum wattage and 12V rail are sufficient for the components you’re installing you should have no problem. Once you’ve figured out the capability of your old power supply you need to take a look at what it offers. There are a few connections commonly missing on old power supplies. Modern motherboards accept a 24-pin primary power connection, but some old supplies will only have a 20-pin plug available. The 20-pin plug should work but it can become a problem if the power limits of the connection are exceeded (the 4 additional pins are used to provide additional power). This is most likely to occur if you use a large number of components that draw power from the motherboard, such as PCI cards. 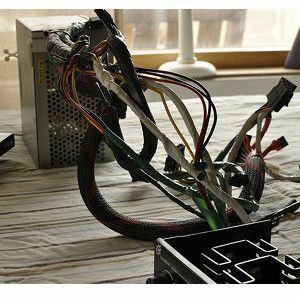 You may also find that your motherboard asks for an 8-pin (4-pin + 4-pin) secondary connection rather than a single 4-pin. A motherboard will often run without with just a 4-pin connection but it may be unstable in certain situations, such as overclocking. A Molex to 8-pin ATX adapter (shown above) usually resolves the problem. Video cards are another source of trouble. They once were content drawing power straight from a motherboard. Today, however, even inexpensive cards usually need a dedicated 6-pin PCI Express power connection. Some even need two 6-pins or an 8-pin. You’ll often be able to power the card using multiple Molex connections with an adapter (shown above). Some video cards even come with these adapters in the box. However, the most powerful cards may not work with this solution. If your power supply is very old it may be lacking modern SATA power. All new hard drives and optical drives require SATA power from the power supply to function. Once again a Molex to SATA adapter (shown above) can be used instead. “Should” is the key word. Power supplies list rating, but there is no industry standard. Manufactures can claim what they want. Some manufacturers are reliable and make power supplies that perform up to or even beyond their specifications. Others, well, not so much. If your power supply’s brand is listed on the label take a look at its reputation online. Bad things can happen to power supplies that are not properly made. One reviewer testing a claimed 750 watt supply from Coolmax, a budget brand, found that it failed when only 500 watts were asked of it. Some supplies will even smoke and burn when they fail! Similar things can happen to no-name power supplies. These are built on a budget for desktop manufacturers like Dell and HP and are expected to power only basic home and office computers. A power supply like this might work. Or it might not. A supply that fails can, in the worst case, take out other components in your PC or even catch fire. Upgrading to a reliable drive from a company like Antec, Corsair or Cooler Master is often the better choice. Hopefully you’ll find that you can use your old power supply and save yourself a few bucks. If you can’t, head over to our power supply guide Power Supplies Explained: How To Pick The Perfect PSU For Your Computer Power Supplies Explained: How To Pick The Perfect PSU For Your Computer Most geeks interested in buying new hardware or building a new system think first of the processor, graphics card and perhaps the hard drive. These components have the most impact on performance, so they are... Read More . You’ll find even more information including the truth about efficiency ratings and details on how to buy the right unit for your PC. We had a batch of computers at work with sources that seemed programed to crash. Within 6 months al were broken. I've used an old one to revive a friend's computer more than once. Great re-use technique. Informative article. Thanks for it. I always prefer new one in new PC. It won't be a "new" computer any longer if it has used parts. This is about as silly as asking: "Can I use my old refrigerator shelves in my new refrigerator?" A new PC comes with a new power supply. If you're foolish enough to build your own, then you should be able to afford an extra $49 for a new power supply. If not; wait until you can afford it. What is the problem with re-using parts? I can see how an old power supply may cause a problem, but generally re-using things that are perfectly fine should be systematically encouraged. It should be easy and beneficial for the user. Less money spent, less stuff to worry about, less trash. Building your own PC is foolish from cost to warranty to incompatibility issues. Buy a whole, new PC from a trusted, local dealership that uses quality parts. Wipe the drive in the old PC and sell it as a whole, used PC. Less hassle all the way around. You sound like you run a trusted local dealership. Just saying. Yes....one who has fielded dozens of calls from individuals who assembled computers that ultimately won't boot an OS. I've never had a computer place make good on their warranty. It was always not covered, or your fault. I suppose it depends on why someone's building their own PC. If the intent is for it to be modular so when something needs fixing or upgrading, you can simply change out a part rather than the whole thing, then it makes sense. If the intent is to have a custom build, because what you want isn't off-the-shelf, then it also makes sense. Thanks for the article.I think I will be buying a new one and upgrading rather than using the old one. I change the older pc's power supplier for security. Yes, most likely. Wouldn't recommend it because an old power supply unit is going to run louder, hotter and with lower power output. Invest in a new one--they are relatively inexpensive. I have a four-year old Antec EarthWatts and Corsair 750 Watt that are still going strong and cause no problems. But bother were relatively expensive for their wattage when I bought them. I think they're paying off over time. Well I found your article very valuable and advised my friend about this who was being fooled by the vendor . Thanks.